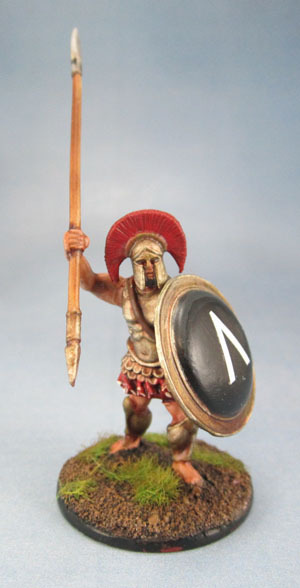 Warlord/Immortal Spartans – The First Dozen | Azazel's Bitz Box. These twelve models are the first of 36 Spartans that Marouda and I started painting the other day after watching a doco about (who else?) Leonidas and Thermopylae. She seemed enthusiastic enough, and off we went. It took three days to clean and assemble the 36 models, and with a bit of daily painting, we’ve (well, almost entirely myself) have gotten the first dozen done. I swapped in a lot of the bronze bell curiasses into this group. Initial paint as noted the other day was a dark Tamiya red spray with a Zenithal highlight of Army Painter Red. Maybe I have a crappy can, but that AP spray really leaves a horrid grainy finish. I don’t think I’ll buy their stuff again. I’d rather pay a slight premium and buy GW or Tamiya’s coloured primers. Anachnonistic Spartans showing their shields. Ready for SAGA Ancients! When it becomes a thing. The Warlord (formerly Immortal) figures are decent enough, and have both positives and negatives. 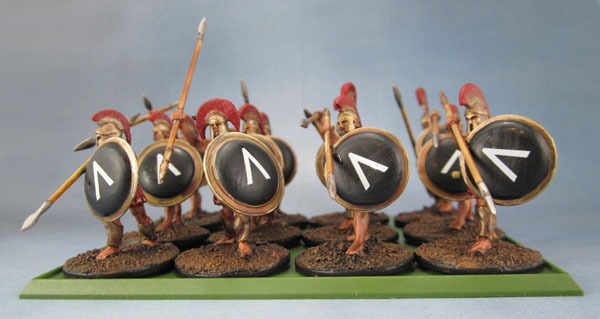 The sprues that make up the majority of the kits are identical between the Spartans, Ancient Greeks and Classical Greeks, with only the command sprues offering any differentiation or extra pieces. The Spartans come with a sheet that has 90 Lambdas, though that’s broken up into 30 White, 30 Black and 30 Red – so if you want uniformity from your box of 40 figures, you need to buy more. Except – here’s the kicker – Warlord don’t actually sell them! I got lucky with Warlord’s quality customer service when I called them the other day and asked to order several sheets. I paid for the EIR sheets and they’re going to manually swap them out for the Spartan sheets, which will give me enough to have some freedom on my boxes of Victrix Spartans that don’t come with any decals at all. Of course when they’re front on, you can’t see their armour decorations. I did my research before putting together or painting these guys. The Warlord models don’t come with cloaks at all, which is a shame. There’s differing opinion on whether Spartan linothorax armour (the linen armour) was dyed red or not, so I went with “yes”. Similarly with the horsehair crests, there appears to be differing opinions on red or black and white, or some combination. Since the Spartans were around for quite some time, I’d guess both are probably correct. Similarly, I chose a “Hollywood” style anachronistic combination of the Corinthian Helmet (worn in earlier times) over the Pilos, along with the Lambda (used in later times – and not yet at the time of Thermopylae). Let’s face it – if anyone were to decide that they don’t want to play with us because the Spartans aren’t historically accurate (and knowingly so! GASP!) then I probably didn’t want to play someone like that anyway. A small unit of Spartans, three deep. Ready for Kings of War! It wasn’t until taking these photographs that I realised I forgot to flock the figures. I’ll have to do that tomorrow. I might go over the shields again with a satin varnish. The matt is a little washed out. Low angle shot to see the rows of shields. These models aren’t going to win any painting competitions, but it’s been a nice thing to finish a dozen models – a unit – from sealed box to ready for the table (after flocking!) in only 1 week. 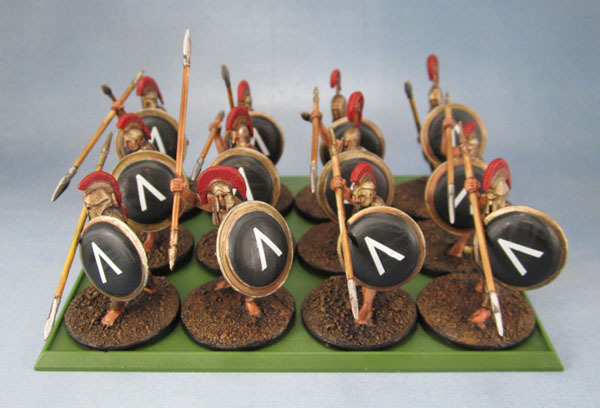 They’re at a tabletop standard that I’m quite happy with for historical models that I literally have hundreds of (roughly 900-1000 plastic infantry between the various types of Greeks and Macedonians – ouch!) It’s also been a good learning experience on what to do and what not to do. Now to get the other two dozen of this batch finished! It also means that my painting total for 2016 is 12 models after 3 days! This entry was posted in Historical Gaming, Mythical Greek Army, Spartans and tagged Immortal Miniatures Spartans, Warlord Games Spartans. Bookmark the permalink. Wow! Still a force to be reckoned with. Shows how good my memory is haha. They’re really cool man. I really like your clean and precise style. As you probably know I like a little rough look to my minis. I’m hoping to get the rest of these guys done soon – so I can get back to the December stuff as soon as possible. I need to get back to Max Payne as well! Really nice work – makes me want to go ancient in 2016 sir! Thanks mate – it’s been a long time coming to actually get some of these guys done. I’ll have at least a couple dozen more of these before I get onto something completely different! How did you find the gameplay of OGaM? Conceptually it looks appealing, but I’m dubious about a lot of the mechanics. Pingback: Warlord/Immortal Spartans, Part Two. | Azazel's Bitz Box. Pingback: A Question of Vikings and Stripey Trousers. | Azazel's Bitz Box. Just tried the rules out, not a big experience with them, but to me, it’s one of the most interesting iteration of the “Song of…” engine. Pingback: Another two Marauder MM16 Dwarf Slayers | Azazel's Bitz Box.